Michigan Gov. Rick Snyder today signed legislation to protect the Great Lakes, provide energy security for the state’s residents, and create better infrastructure connections between Michigan’s peninsulas. The new Mackinac Straits Corridor Authority will oversee construction and operation of a tunnel in bedrock beneath the waters of the Straits of Mackinac. The tunnel will house a replacement segment for the Line 5 petroleum pipelines that currently sit on the bottom of the Straits and will accommodate other utilities to improve infrastructure connections between the peninsulas. Senate Bill 1197 is now Public Act 359 of 2018. Gov. Snyder also appointed three members to the authority. According to the new statute, no more than two members can be from the same political party. Initial appointees include Geno Alessandrini (D-Iron Mountain), business manager for the Michigan Laborers District Council; Anthony England (D-Ypsilanti), dean of the College of Engineering and Computer Science at the University of Michigan-Dearborn; and Michael Zimmer (R-Dimondale), cabinet director for Gov. Snyder. 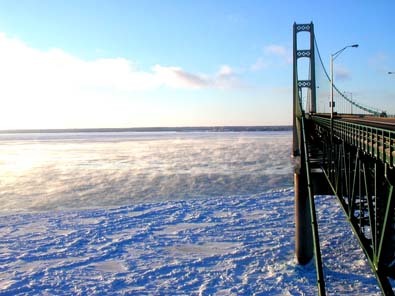 Zimmer will resign from his appointment to the Mackinac Bridge Authority (MBA). Members will serve six-year terms and are subject to the advice and consent of the Senate. The chair will be chosen by the authority members. Under agreements already signed by the state and Enbridge Energy, the company will pay for 100 percent of design, construction, operation, and maintenance of the tunnel for the next 99 years. It will also decommission the twin pipelines in the straits once the tunnel is complete. The project is expected to cost as much as $500 million and create jobs in the professional trades while continuing to provide stable energy prices for state residents. The authority will own the tunnel after its construction and provide independent oversight throughout its life. The authority will be subject to the Open Meetings Act and Freedom of Information Act. The new law also creates a Straits Utility Fund to pay for the work of the MSCA, including independent experts to ensure proper construction and operation of the tunnel. The authority will have administrative support from the Michigan Department of Transportation (MDOT) and will be separate and independent from the MBA and MDOT. The authority will provide reports at least annually to the MBA and the MDOT director on construction progress and utility leasing. The law requires the authority to enter into an agreement with Enbridge on the construction and operation of a straits utility tunnel by Dec. 31, provided certain conditions are met. The proposed new agreement must include a plan for recruiting, training, and using Michigan workers for the project; allow for multiple utilities to use the tunnel; provide that the tunnel is built to last and will contain potential oil spills; limit liability for the state, the authority, and members of the authority; require that all necessary government approvals be obtained for the tunnel; prohibit the use of eminent domain to acquire property for the project; ensure the state bears no cost for design, construction, operation, and maintenance of the tunnel; ensure that any privately owned portion of the project, including the above-group entrances and any utility lines within the tunnel, are subject to taxation; and reimburse the MBA for any net loss of profit for leasing space for telecommunication lines. Previous articleTroy’s Rehmann Merges with Florida’s Lamn, Krielow, Dytrych & Co.